Pirate, privateer, French naval officer and Painter to the Emperor - Ambroise Louis Garneray was an archetypal ‘Renaissance Man’. His father was an artist and pupil to the great Jacques-Louis David, which gave Garneray an excellent artistic upbringing. Ambroise, however, persuaded his father to let him go to sea at the tender age of 13 as part of the French Navy, and he soon found himself in the Indian Ocean off Ile de France (modern day Mauritius). When there was a shortage of Naval vessels, Ensign Garnerary decided to join the famous Breton privateer Robert Surcouf, and become the scourge of East India Company shipping in the Indian Ocean. During this time Surcouf captured the Royal Navy’s HMS Kent near the coast of India thus taking a fortune in prize money, and Garneray not only received his share of booty, but was also asked to paint pictures of the heroic action as an eye-witness and crew member. In March 1806 after various privateering and trading trips, Garneray was captured by the English and spent the next 8 years on a Prisoner of War hulk in Portsmouth harbour. 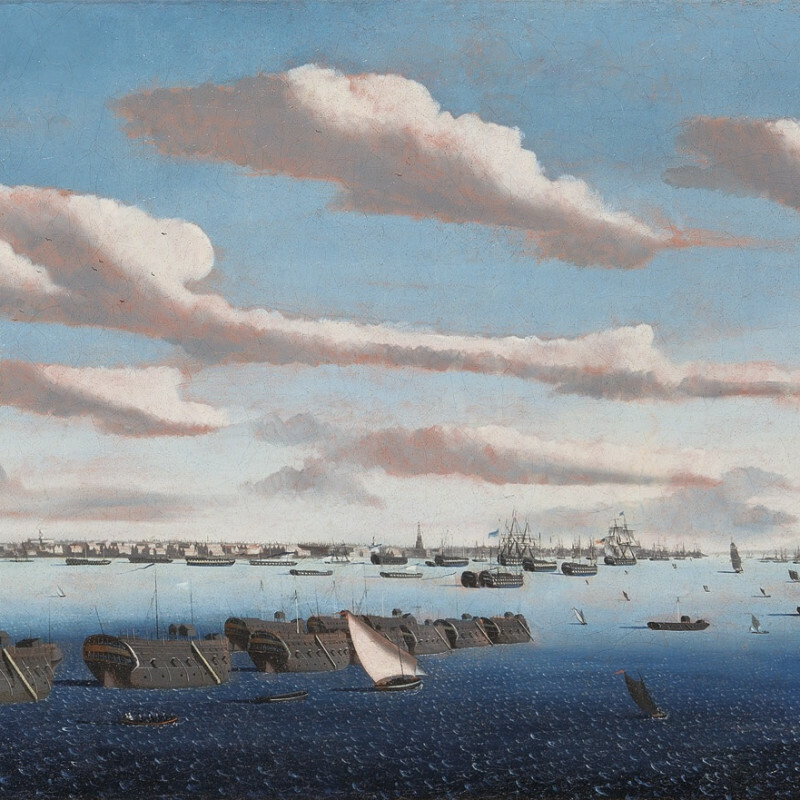 The loss of the American colonies in the 1770s as a place to send prisoners condemned to transportation, created an acute shortage of prison space. There was no time to build more prisons so as a temporary measure some ships were converted into prison hulks, which could easily be made secure although the conditions aboard their often-rotting hulls were tough. It was during the French Wars of 1793 to 1815 that the greatest use of hulks was made to accommodate additional prisoners of war. In order to make his incarceration more bearable Garneray managed to paint and sell views of the hulks via a local art dealer. This helped improve his conditions in captivity, in the way that many other prisoners also did by making ship models or other handicrafts. When Napoleon abdicated in 1814, the British freed their prisoners and Garneray returned to Paris, continuing to work as an artist. He later wrote three popular autobiographies recounting his adventurous double career as a sailor, corsair and artist.